Fill out the form below or call 718-786-6401 to schedule a free estimate. When your commercial air ducts need comprehensive and expert cleaning, look no further than G & G Duct Cleaning. For over 50 years, our family owned and operated company has been performing thorough air duct cleaning to ensure cleaner air. We start by cleaning your entire air conditioning system by utilizing the state-of-the-art 5000 CFM high pressured vacuum system manufactured by Nikro Industries. This system produces negative pressure in the duct system and the compressed air brushes dislodges all soot from within the duct work and is then collected inside our HEPA filtered vacuum system. 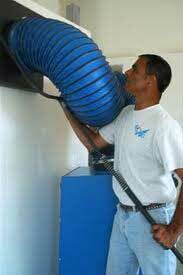 The HEPA vacuum system removes containments in the air, 99.5% efficient down to the .3 microns. After the system is completely cleaned, we then sanitize the entire system. At G & G Duct Cleaning, our owners personally perform all estimates. Email G & G Duct Cleaning Today! © 2013 G&G Duct Cleaning. All Rights Reserved.